Welcome to Friday’s weekly photo caption contest, BLOG BLURBS! Every Friday at 7 pm EST a new toy diorama will be posted here on the KRonikle. 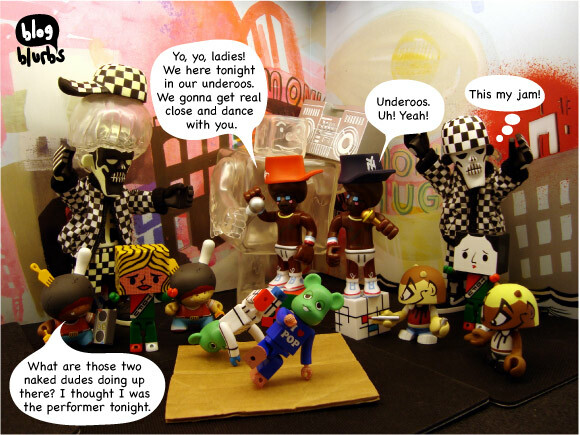 Enter to win a DUNNY blind box prize pack by leaving comments of what you think the toys are talking about. Click the thumbs up to vote on your favorite quotes. Voting booth closes next Friday at 6pm EST. BLOG BLURBS runs all throughout the week and it’s up to you to fill in the blanks. So let the creative juices flow and check back to see what develops. We will announce the winner next week. Congratulations to L.L.T. for last weeks winning commentary!